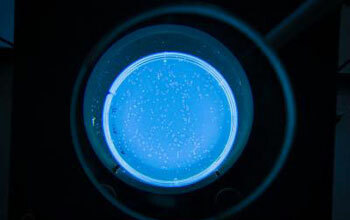 Long-term E. coli experiment yields surprising results regarding complex trait evolution. View video interviews with Michigan State University postdoctoral researcher Zachary Blount and professor Richard Lenski. Several years ago researchers at Michigan State University (MSU) reported discovering a novel, evolutionary trait in a long-studied population of Escherichia coli, a rod-shaped bacterium commonly found in the lower intestine of mammals. The E. coli added a helping of citrate to its traditional diet of glucose, even though other E. coli can’t consume citrate in the presence of oxygen. These same biologists have now analyzed this new trait’s genetic origins and found that in multiple cases, the evolving E. coli population needed more than one mutational step before the key innovation took hold. Complex traits, like using a new food source, are thought to be difficult and arise rarely, making the research of broad interest to both evolutionary biologists and public health scientists. The findings, reported in this week’s journal Nature, document the step-by-step process by which organisms evolve new functions. The study also highlights the importance of evolutionary changes that alter the physical arrangement of genes, leading to new patterns of gene regulation. E. coli normally can’t digest citrate when oxygen is present because they don’t express the right protein to absorb citrate molecules. Citrate is a salt or class of citric acid commonly found in fruit such as lemons. So how did this mutation occur? To find the answer, postdoctoral researcher Zachary Blount and MSU Hannah Distinguished Professor of Microbiology and Molecular Genetics Richard Lenski analyzed dozens of complete genome sequences from bacteria that had evolved this new trait and had been sampled and stored at different time points in the history of the lineage. The National Science Foundation’s Division of Environmental Biology partly funded the research, as did the NSF-supported BEACON Center for the Study of Evolution in Action. The team used samples from Lenski’s long-term E. coli experiment that started in February 1988 and has been ongoing for more than 24 years. The experiment allows Lenski and his students and colleagues to study more than 56,000 generations of bacterial evolution. In terms of generations, it is the longest running evolution experiment in history. Twelve populations of E. coli live in an incubator in Lenski’s laboratory producing about seven new generations every 24 hours. Each day, scientists take one percent of each population and transfer it into a new food source, a flask containing fresh glucose, which the bacteria readily eat, and citrate, which one population discovered how to eat after more than 30,000 generations. The researchers also take samples every 500 generations, and freeze them for later study. Because they freeze the samples, when something new emerges the scientists can go back to earlier generations to look for the steps that happened along the way, which is what occurred in this case. The researchers found that at least three mutations were required for the bacteria to effectively use citrate when oxygen is present. One or more mutations were necessary to set the physiological stage for the two later events. Then a critical gene duplication occurred that effectively re-wired the expression of a previously silent gene. Additional co-authors include Jeff Barrick, University of Texas and Carla Davidson, University of Calgary. To learn more about this research, see the journal article in Nature magazine.